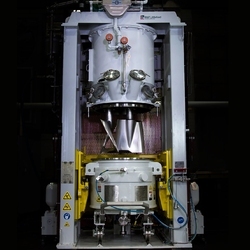 The B&P Littleford Vertical Planetary Batch Mixer includes blades that rotate on their own axes, while orbiting the mix vessel on a common axis. Our unique blade design continuously advances along the periphery of the bowl, removing material from the wall and transporting it to the interior for mixing. After one revolution the blades pass through the entire bowl, after three revolutions the bulk of the material is mixed, and after only 36 revolutions, the blades contact and virtually mix the entire batch resulting in a homogeneous mixture. This mixer was specifically designed to handle the processing of energetics materials in a safe manner. It has been engineered to have an ample amount of power, pull a full atmosphere of vacuum without contaminating seals or pulling lube oil into the mix, and achieve full mix in a very short amount of time. B&P Littleford’s extensive experience with the energetics industry clearly indicated adapting an existing mixer would never be good enough – this mixing machine was created for energetics from the ground up. One of the largest propellant mixers ever built, the Regal Rocket Propellant Mixer (J.H. Day 1,800 gallon) was built. The Regal stands 38 feet high and weighs over 160,000 pounds. It is driven with a 400 horsepower motor. Contact us for more information on the capabilities of the B&P Littleford Vertical Planetary Batch Mixer.